A firm favourite of maritime users and sewage works operators, our stainless steel wire rope comes in an 18×7 configuration, with this 11mm 18×7 Stainless Steel Wire Rope example being just one of the many options we can produce from scratch and supply to you as a custom assembly. While a diameter of just over a centimetre may not seem enough to make a wire rope especially sturdy, this product proves that looks can be deceiving. It has a WLL of 6,352kg and a 62.3kN breaking force rating, both of which will come into play during a variety of operations. 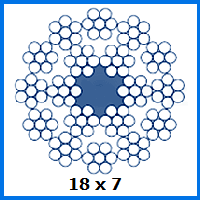 The 18×7 arrangement of wire strands leaves the outer surface of this rope less liable to wear and tear. It is also resistant to rust that might result from use in moist areas, with even the effects of salt water not taking a toll on its integrity. One consideration worth keeping in mind is that simpler strand configurations, like our 1×19 stainless steel rope, can be sturdier at the same diameter. We do not just produce rope on its own; our specialists can install end terminals from a wide range of fittings if you wish. Supply us with your desired specifications and let us do the rest to make a bespoke product just for your organisation. You can reach Rope Services Direct by dialling 01384 78004 or filling out our online contact form with your details. 11mm 18x7 Stainless Steel Wire Rope Overall rating: 5 out of 5 based on 6 reviews.